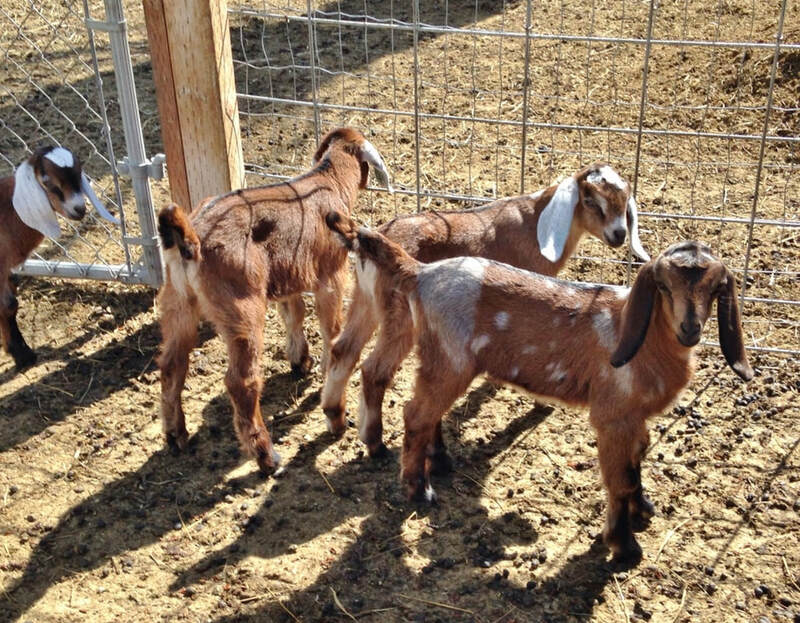 Though they are no longer a part of our herd, these are the goats that were a big part of developing our herd. Green Gables Hershey's Bliss "Smalls" dam. Evan has gotten too tall for our mini's !! 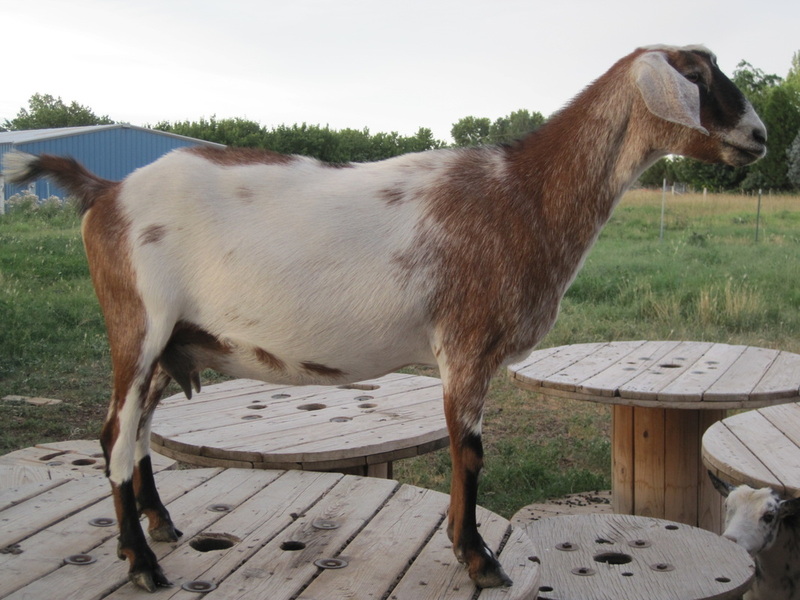 "Evan" is a 6th Gen purebred buck out of WRRanch Heidi. 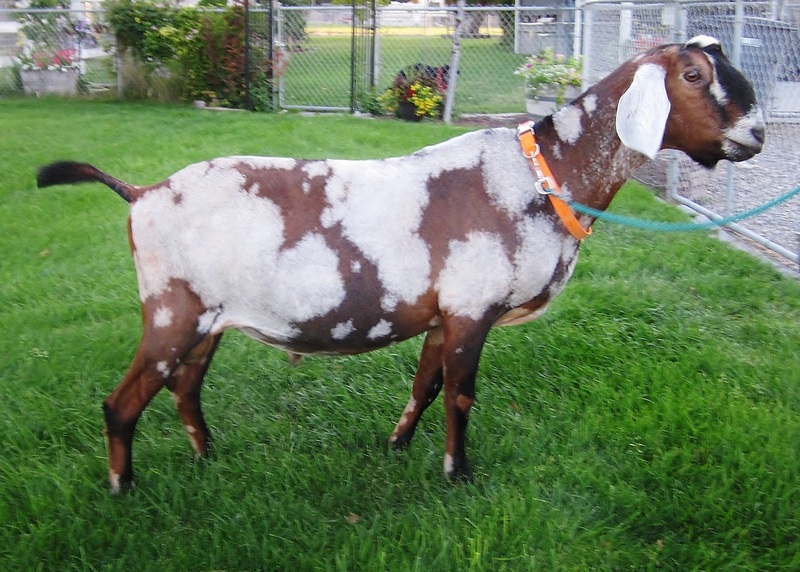 His dam earned her milk star on her second freshening and produced 11# of milk at her peak. 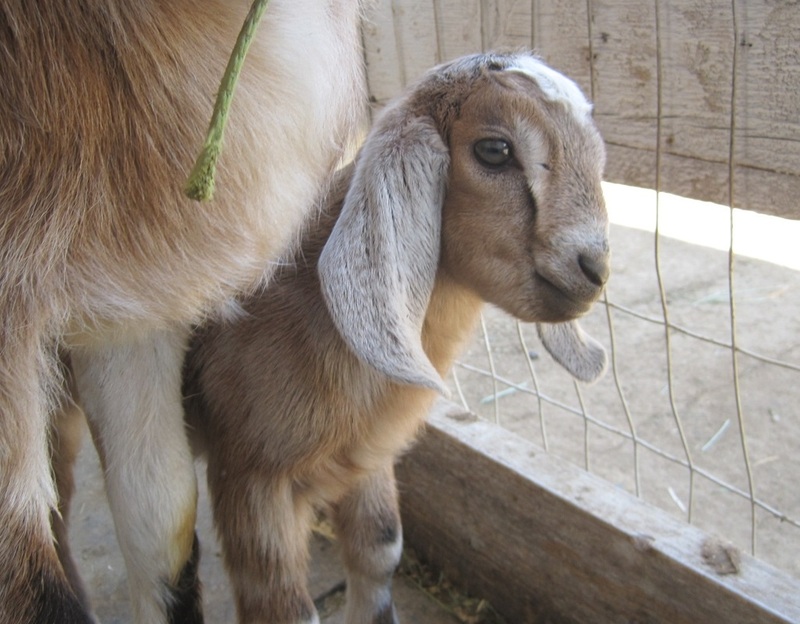 She was an easy to milk doe with a soft udder. Evan has produced some beautiful kids for us and we have several of his daughters in our herd. Unfortunately, he was very close to 33 inches tall at 3 1/2 years old. He stayed at 30 inches for his entire 2nd year and then must have had a growth spurt. Since we already have some of his offspring we found him a great home in Virginia. 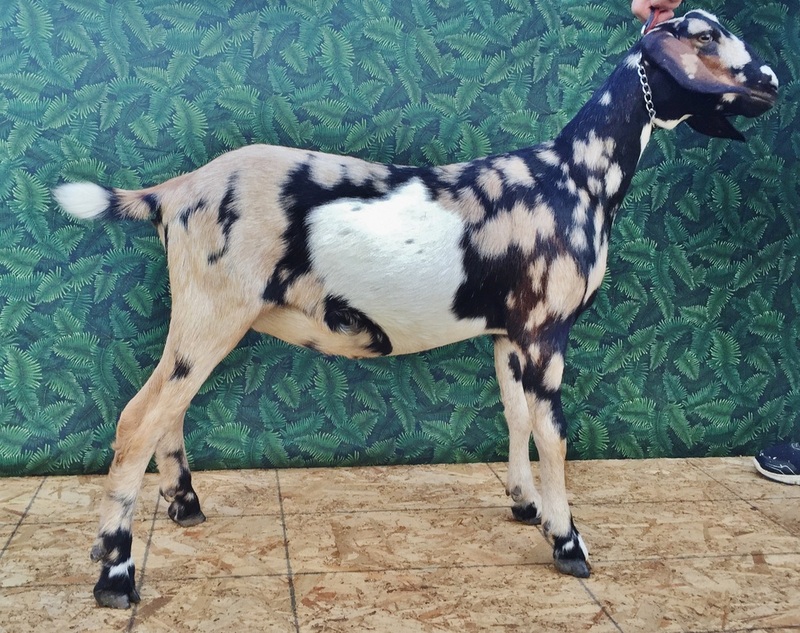 He is still going to be used for his great milk genetics and his wonderful breed character and color. Evan is Negative for CL, CAE, and Johnes. Evan's gorgeous head and ears. 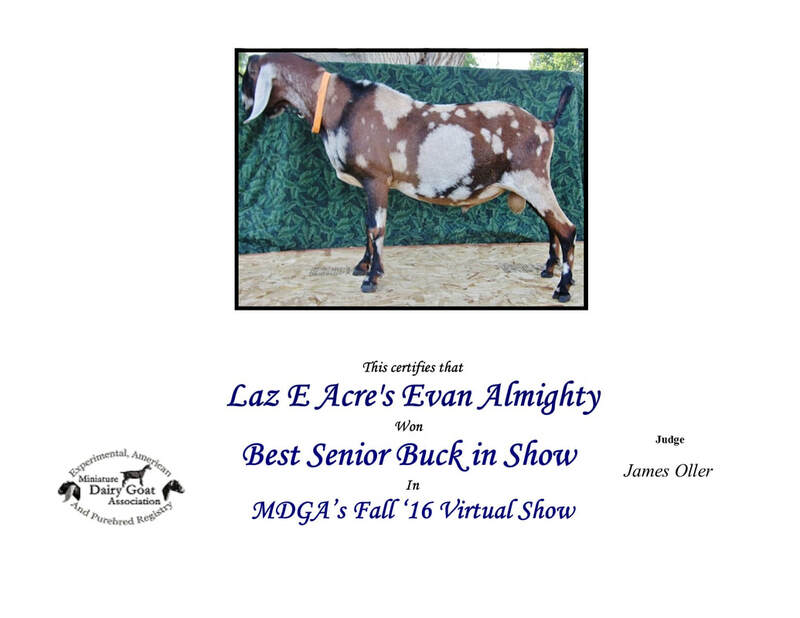 Evan earned Grand Champion and Best Senior Buck in Show! Evan's 2015 daughter's FF udder. Evans son. He always throws that gorgeous breed character. 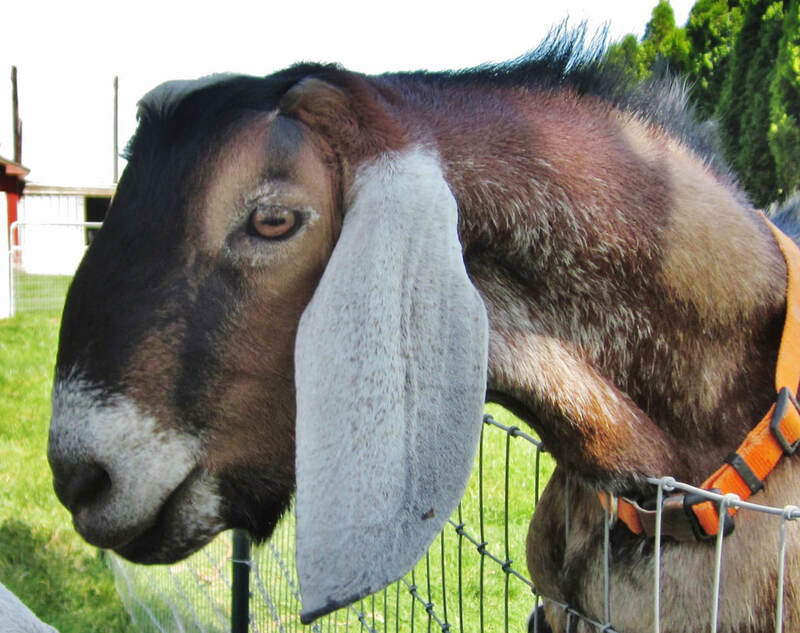 Dolly's beautiful head and ears. What can I say about "Dolly?" She is a beautiful Moon Spotted yearling doe with lovely correct head and ears. She is wide in front and rear. 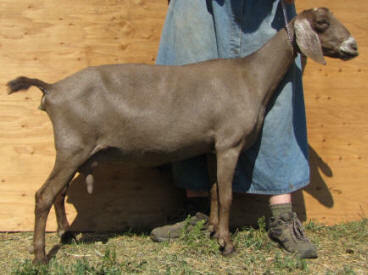 Her dam is a sweet doe with a lovely soft udder, correct teats, and is a dream to milk. Her dam has gone to a new home so we can't wait to see what kind of udder Dolly will give us. 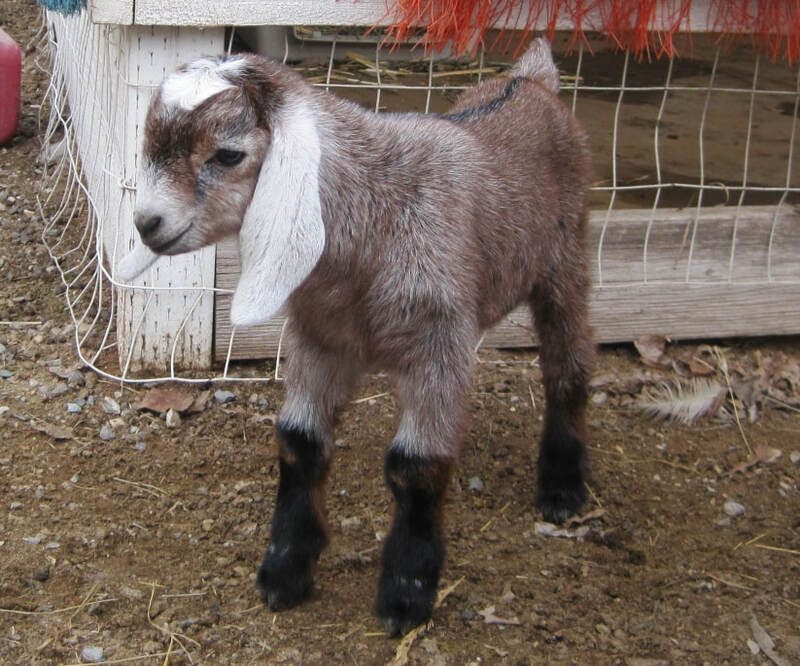 "Dolly" at 1 day old. 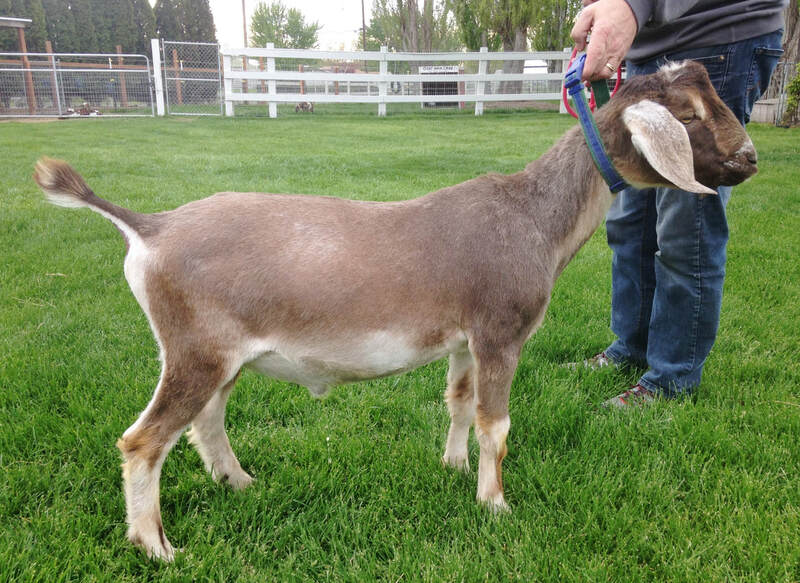 "Gladys" came to us from Eveland Farm's herd in Hermiston, OR. She is wildly moon spotted and has a gorgeous head and ear set. She has decent length, is wide and level plus she just has tons of capacity to her body already seen as a kid! She is the first to meet us at the gate for anything and is always right in your pocket. She has learned to untie shoes and thinks that is a great game, so we double tie everything now. We know she will be bringing us lots of color and hopefully her great friendly personality. Thank you Carol for letting us purchase this beautiful doe. Mana's right side with her lovely Moonspots. 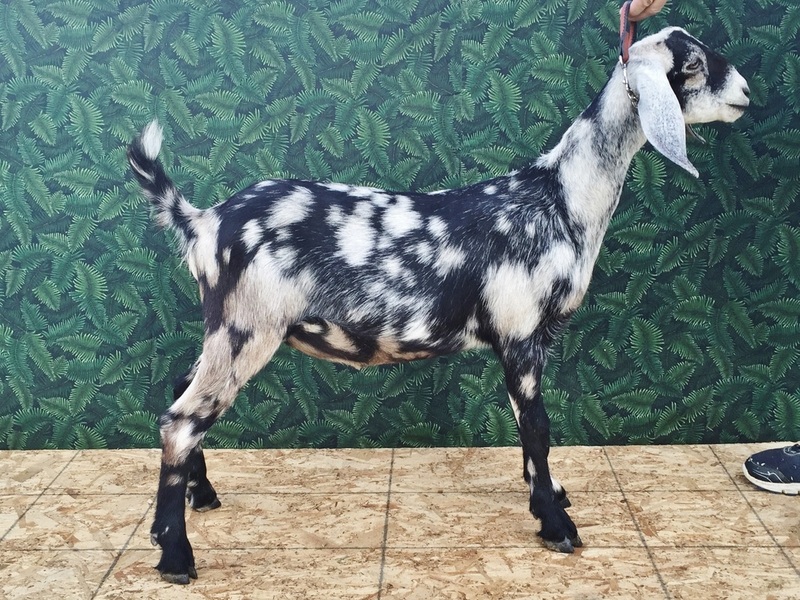 "Mana" is an absolutely gorgeous doe out of "Bunny's" line, our herd queen. We are so blessed to be able to bring this great breeding back into our little herd with another of her granddaughters. This little girl is just more proof that Bunny's mellow personality passes on to her offspring. Mana is just as friendly and sweet as her dam and grand dam. 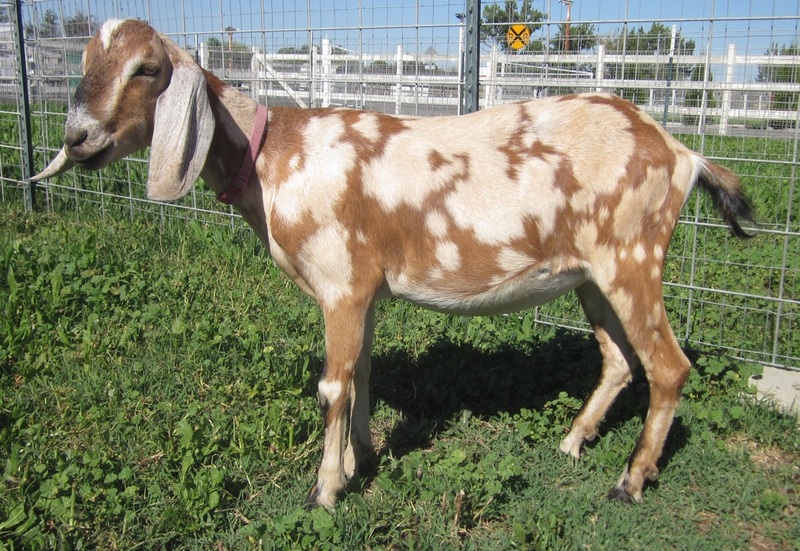 She is long and level with great width, a super Roman nose, and long wide ears. As sweet and gentle as she is, she can still scream like a girl when she wants something. Mattie was a very solid doe that stood on strong legs and feet. She was extremely level on top and produced several champion Kids. We have had several of her offspring in our herd. These are Mattie's 2017 kids. Reno's left side 1 year old. Reno gave us some beautiful kids. 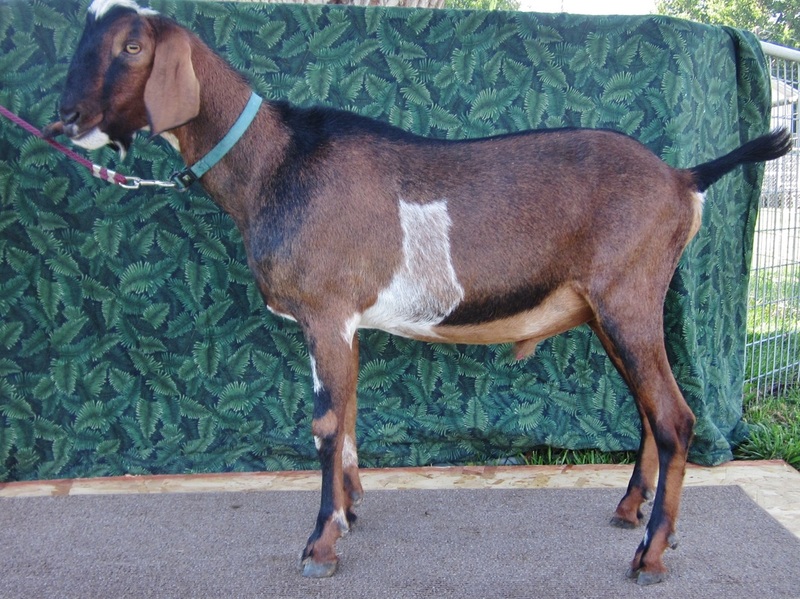 He was developing into a very nice buck but unfortunately got too tall to qualify as a Mini Nubian Purebred. 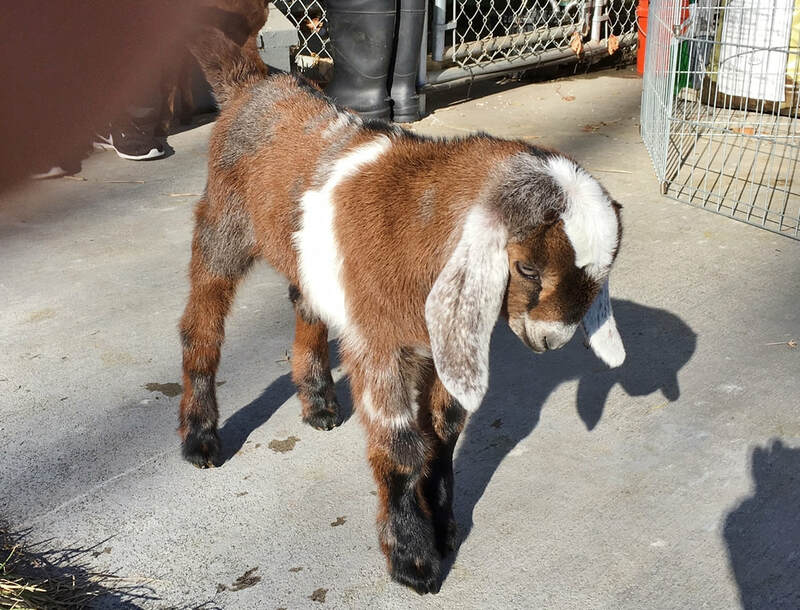 He got a nice home with a family raising standard sized goats. We still have some of his genetics by breeding to smaller does. We will be looking forward to seeing how his offspring turn out. Some of Reno's Offspring in 2017 These kids are very nice. Long and wide with great breed character. This is Laz E Acre's Mr Blue Jeans. 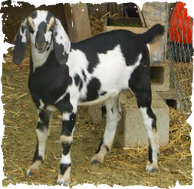 "Levi" is one of Reno"s offspring that will stay in our herd as a up and coming herd sire. He is Polled and Blue Eyed as well as Moon Spotted! This is Laz E Acre's Mr. Haney. Caldwell Creek's Feline by WRRanch Morgan. Mr Haney was our very first bred and raised Herd sire. 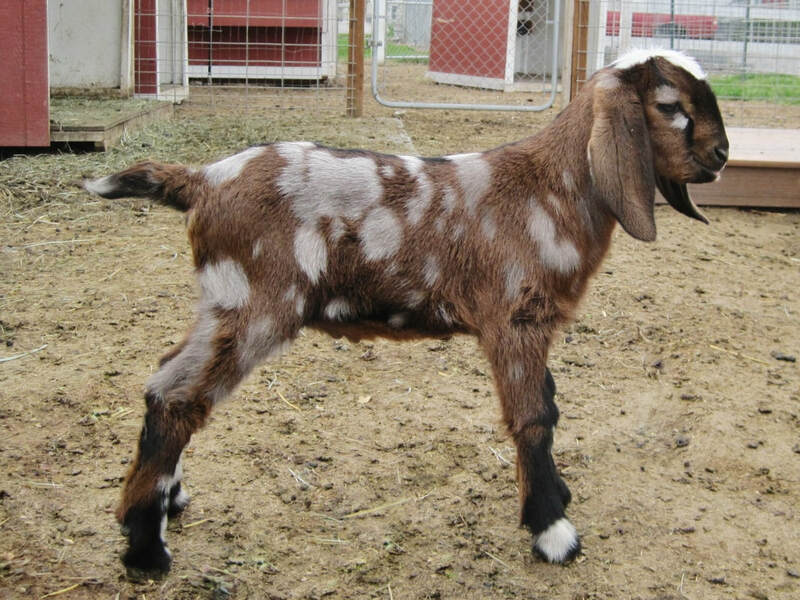 He sired twins for us, a buckling and a doe, before he was sold. Both were nice kids with lots of Moon spots.